Health will be perfect today. Money position improves as delayed payments are recovered. There may be opportunities to attend social functions- which would bring you in close contact with influential people. Exciting day as you receive a call from your beloved. Today you will get lot of interesting invitations- and a surprise gift could also be coming your way. You will spend the best day of your life with your spouse today. Hone your photography skills. You are going cherish some of the moments you click today. Remedy :- Worship Lord Shiva and attain good health. Gemini Daily Horoscope will help you to know about your routine tasks before it takes place. It will enable you to know the positive and negative effects of your daily events in your life. You would be informed on priority basis about pros and cons of any event before commencing it. It is good for you if you are informed earlier about any bad event happening to you. What is Gemini Zodiac Sign? Gemini horoscope today is based on the third sign of Kaal Purush Kundali. It is the third house of Kaal Purush Kundali as well as in Zodiac belt. It starts from 60 degree from vernal equinox and ends at 90 degree on longitude. This zodiac sign contains Third and Fourth Padas of Mrigashira, all padas of Ardra and first, second and third padas of Punarvasu Nakshatra. Gemini is ruled by the planet Mercury. It is an intelligent planet. No planet either gets exaltation or debilitation in this sign. Saturn and Venus are its friendly planet whereas it shows enmity with other planets specially Jupiter, Moon etc. It is just opposite to the Sagittarius sign in any horoscope. It is first of airy and mutable signs. It is masculine and positive. Jupiter is said to be detriment in this sign as it is the lord of next opposite house i.e. Sagittarius, the opposite sign of Gemini. It is a dual sign in Vedic Astrology. 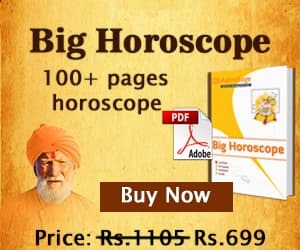 Gemini daily horoscope will help you know more about the Gemini Zodiac sign. Being an airy sign, they live mostly in their mind. They are carefree and joyous. They have a strong and positive mind. They are oftenly versatile, restless and inclined to have changes. They can easily understand people and adapt readily as per circumstances. Being the third sign of Zodiac, they like to travel frequently. The journey can be short distance travels through lands. They consider advantages and disadvantages and then take decisions accordingly. Hence we can say in short that they take time before going ahead with a decision. Being twins in sign, it is very quick which means people born under this sign are very adaptable, sharp and intelligent in nature. Being dual in nature, they have the ability to handle more than one business at a time. They should avoid extremes. They may have dual experiences in their life. These people can be considered in any emergency situation as they would be able to respond quickly to the necessity and requirements of the moment. They have few faults like waywardness, fickleness and leaving their work unfinished, like, they are working on any project, they will leave it in middle and start another work. However, they may handle multiple tasks at a time. They are difficult to understand and possess a peculiar behaviour to respond. They love diversity, moving from one place to another. They like to change their weather which they belong by settling down at other place. They like to move from one thought to another. They don't want to be bound by any rules and regulations. They are happy only if they work unexpectedly rather than any previously known convention. They reveal intellectual qualities and mental dexterity. They understand, analyse the situation and have a quick grasp with much retentive power. They have logical, clear and quick mental action. They stay alert to face any new challenge and idea. They are quick-witted and clever. They are changeable in nature. They will have much curiosity to know about any fact. He will always go in depth in order to research for the same. They have talent to know many languages. Being an intellectual sign, they do not face any difficulty in remembering things. They cannot concentrate over any one task. They have very wide range of thoughts. They are not afraid of asking questions until and unless they get a better idea or approach to understand it. They are very hasty in their approach. What does Gemini sign signify in various aspects of life? Bookkeepers, clerks, accountants, commercial travellers, salesman, agents, representative, editors, reporters, lecturers, journalists, postal employees, engineering, decorative artists, school teachers, professors, guides, photographers, employees in transport, railway and airways, personal assistants, tutors, cashiers, dealers in scooter and cycles etc. Environment: Gemini natives look busy due to frequent visits by relatives, business partners, customers and friends. They manage their family well. They love to decorate their home and want to modernize it time to time through renovation or decoration with different items. If they are living at a place where owner of the house is mean, then they will definitely not hesitate to change the residence immediately. Marriage: These people are very friendly in nature. So they make friends very quickly. They may also find flaws really quick too. Hence they will always lag behind to find real friends. They never get satisfaction from any friend. Due to its dual nature, they prefer variety in life. Romance will make them happy. More the romance in life, more happy they will be. They are drawn more towards intellectual minds rather than emotions. They search for love from an intellectual angle and are often calculative. Marriage is exciting and full of interest for them.They feel lucky if they get steady partners. Marriage will be delightful and successful if partner is equally intellectual. The partner should be clever enough to understand the proactive approach of his partner. Gemini have good partners born under different airy signs like Libra and Aquarius, as these two form trine relationship with Gemini. Lucky day: Wednesday is the day ruled by planet Mercury, ruling lord of Gemini. Thursday will be the lucky one and Saturday will prove to be difficult in regard with work, loss in business etc. Sunday will come with short journeys. Monday will show increase in income. Friday indicates pleasurable pursuits or expenses. On Tuesdays, there may be disputes with somebody. Hence the most lucky day will be Thursday for them and after Thursday, Wednesday will be favourable day. Lucky Number: 5 and 3 or 14, 12 etc. What do all 12 houses signify for Gemini Born? First House: It tells about yourself. Gemini itself rules over the first house for Gemini born people. It is ruled by the planet Mercury. Second House: It tells about Wealth, Family and Finances. Cancer rules over the second house and is ruled by the planet "Moon'. Third house: It represents Communication & Siblings in any horoscope. Leo rules over this house of astrology and its ruling planet is Sun. Fourth House: It represents "Sukhsthana" or the house of mother. Virgo rules over fourth house for Gemini born people. Mercury itself is the lord of this house. Fifth House: It shows the Children and education. Libra rules over fifth house and the ruling planet for this house is Venus. Sixth House: It shows debt, disease and enemy. Scorpio rules over Sixth house and the ruling planet of this house is Mars. Seventh House: It shows the partnership, spouse and marriage. Sagittarius rules over seventh house for gemini born and the ruling planet is Jupiter. Eighth House: It shows "Longevity" and "Mystery". Capricorn rules over eighth house and the ruling planet of this sign is Saturn. Ninth House: It shows "Guru/Teacher" & "Religion". Aquarius rules over Ninth house and the ruling planet is saturn for this sign. Tenth House: It indicates career or profession or Karma sthana. Pisces rules over tenth house for Gemini born people and the ruling planet is Jupiter. Eleventh House: It indicates gains and incomes. Aries occupies eleventh house for Gemini Born people and the ruling planet is Mars. Twelfth House: It shows the expenditure and losses. Taurus occupies this house for Gemini born people and it is ruled by the planet Venus. We have shown you many traits about Gemini sign or Mithun rashi through gemini horoscope today. I hope you enjoyed it. If you are an Gemini ascendant or Moon sign, you may have notion about your inherited personality traits.